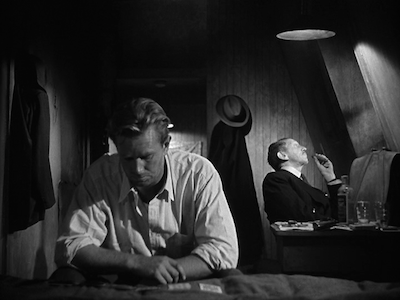 Sterling Hayden may be the king of film noir endings. 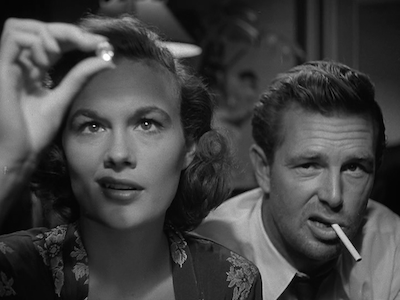 The bitter and tragic finish of The Killing has often been bandied about as the quintessential noir finale, but there is a strong case to be made for the closing of The Asphalt Jungle. 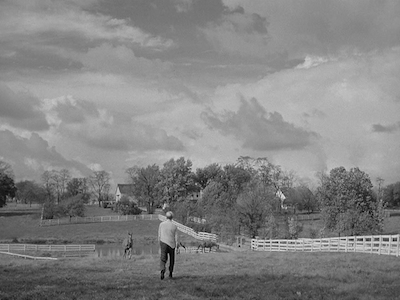 It’s brutal, and yet bucolic; the bad man mere feet from salvation, on a farm, surrounded by curious horses, before succumbing to the inevitable. Hayden’s tough guy, Dix Handley, is a victim of his own drive. He nearly had the film noir safe haven of a good woman and a rural retreat, but like so many others, Dix can’t outrun fate. He ends up flat out in the dirt. 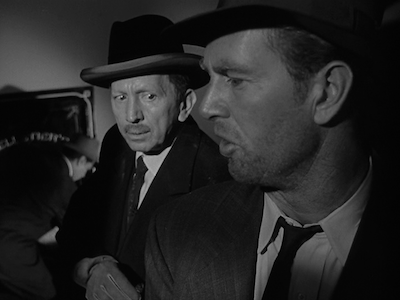 The Asphalt Jungle is John Huston’s 1950 heist film. He directed and co-wrote with Ben Maddow, whom he also worked with on The Unforgiven [review]. Maddow would shortly after be blacklisted and find much of his influential work, including scripts for Johnny Guitar and The Wild One [review], credited to another scribe. Their joint script tells the story of a small band of crooks looking to make a big score. A notorious criminal planner, Doc Riedenschneider (Sam Jaffe, The Scarlet Empress), knows where and how to get a million dollars worth of jewels. 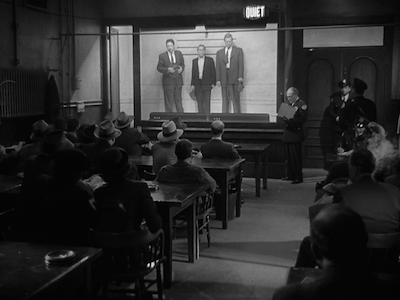 Backed by the double-crossing lawyer Alonzo Emmerich (Louis Calhern, Notorious [review]), Doc puts together a four-man crew, including Hayden’s Dix, a driver (James Whitmore), and a safe cracker (Anthony Caruso). Naturally, Doc’s job works on paper, but unforeseen wrinkles prove to make the aftermath of the crime more difficult than anticipated. Huston spends a short, but meaningful amount of time on the theft. 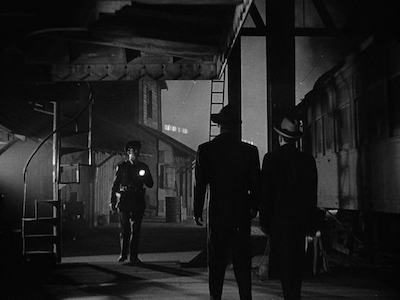 Thought not as meticulous in his details as, say, Jules Dassin in Rififi [review], there is a similar quiet methodology to how the director stages the crime. The crooks are professional, and so they move carefully, each doing their job as expected. Steel nerves are required as the explosion opening up the vault starts off a chain reaction of burglar alarms everywhere else on the street. With the cops distracted, the boys sneak out undetected, but the dead body they leave behind causes the hunt for them to intensify. 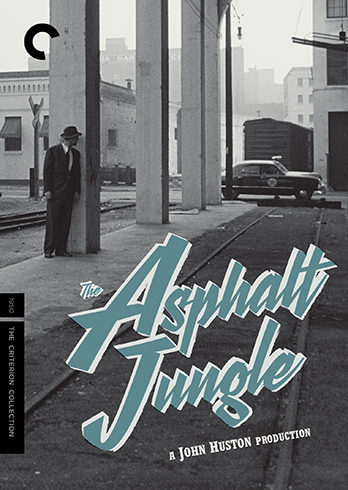 Structurally, The Asphalt Jungle is balanced out pretty evenly between the preamble to the heist, the heist itself, and the resulting escape and manhunt. 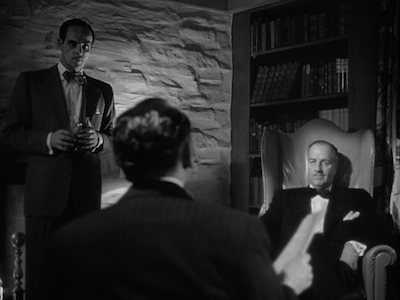 It’s the opening bits that really set The Asphalt Jungle apart from other such films. Huston is interested in examining the day-to-day lives of the criminal underworld (the original tagline was “The City Under the City”). He approaches their activities with the same sober eye he might turn toward a workplace drama. These are guys just getting by, a slave to their habits, buried by their past choices, and living paycheck to paycheck, even if that next paycheck comes from their next crime. They work in a profession with its own jargon, hierarchy, and consequences. You could get “promoted” and jet to a tropical climate to spend your earnings, or you could get fired, heading off to jail or, worse, the morgue. Another notable player in The Asphalt Jungle is Marilyn Monroe. She has two memorable scenes in the movie playing Emmerich’s sidepiece. Though still a couple of years from becoming a true leading lady, 1950 was pivotal for the starlet in that it brought her two of her most memorable bit parts: All About Eve and The Asphalt Jungle. Huston could not have cast the role of Angela any better, nor could he have taken greater advantage of Monroe’s natural gifts. Though on screen for a very short time, she is coquettish, judgmental, flirty, and emotional. She presents a seductive front, only to crumble under police pressure. Alluring, yet vulnerable. If only there had been a little bit of comedy, Marilyn could have displayed all of her wonderful talents. In a way, Angela suffers the same kind of fate as the crooks, including her sugar daddy, in that her downfall springs from her individual desires. One by one, the police discover each member of the gang, all of whom somehow trip themselves up by letting their weaknesses get the better of them. It’s a payoff for all that time that Huston spent stitching their lives together. The fact they are individuals with their own concerns and their own peccadilloes means in some way they can be gotten to. As in many a noir, the one thing a man can’t escape is himself. Huston straddles the line between noir and serious crime drama. He doesn’t rely heavily on the tropes of the genre, so much as he picks and chooses what he needs. This can be said for the visual storytelling as much as for the narrative storytelling. Working with director of photography Harold Rosson (The Docks of New York [review]), Huston plays around with his environment. His arrangement of characters in a frame can allow for them to appear small in a space that is much larger than them, or cramped in such a way to suggest it can barely contain them. Sometimes the crooks appear to be stacked on top of one another, other times, men who are at odds can appear to be separated by an illusory distance. Objects can loom. A clock in the extreme foreground reminds us that time is running out. The sky can appear so large as to be impossible. Huston and Rosson indulge in impressionistic shadows when the story demands it--when the crooks escape in the sewer, or when Doc and Dix are trying to sneak through town undetected--but otherwise the filmmakers approach the locale with a certain normalcy, letting the inkiness grow in a more natural sense, less exaggerated. This is a regular town, and a regular life can be had here. In other words, this Asphalt Jungle might be just across the street from where you live, meaning there is little separation between your life and theirs. “Normal” just happens to depend on your zip code.